Is there a big move in your future? Whether you are going into a new apartment or your dream home, you have a lot of packing ahead of you. The goal is to make sure you’re ready when the movers show up. The last thing you need to be doing is tossing things into a box while movers are waiting to load it up. It would help if you begin packing on the same day that you give your notice. That will mean you have 30 days to get everything into boxes. That’s more than enough time to pack up any size house. It’s also a very stress-free way of doing things. 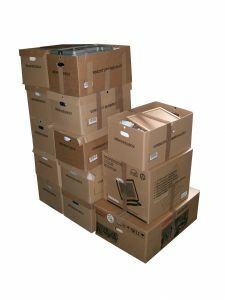 In fact, with this approach you could have everything packed up a week in advance of your move. When packing boxes, is important to fill them up. This doesn’t necessarily mean weighing them down with things but instead you want to make sure there’s no empty space in the box. This will prevent the box it’s being stacked on top of it from crushing it down. You can put in old newspapers or other packing materials to fill the gaps but a better option would be to pack all your clothes in those random boxes. You can even use some of your clothing to wrap fragile items like glassware. Nothing should go on to the moving truck that is empty. That means you can fill up your suitcases and even your trashcans with all kinds of things. A suitcase with wheels is perfect for a stack of books. When you pack up your closet, use a garbage bag pull down over several items on hangers. That becomes an instant garment bag. As you go through your closet and no doubt find a lot of outfits that you have no intention wearing again. In fact, you’re sure to come across a lot of clutter throughout your home that you could get rid of. Not just a bunch a small things but also big pieces of furniture that you’re replacing at the new place. You definitely don’t want to bring that stuff with you. Instead, it’s time to hire Junk King Dallas Mid Cities. Junk King Dallas Mid Cities will be able to clear out all your unwanted clutter in a matter of minutes. You can schedule them either for the day before the move or the day after. You also don’t have to worry about anything going to waste. Junk King Dallas Mid Cities will probably donate the bulk of what you turn over to them. That should make you feel good about getting rid of your stuff. Before your next big move, the only smart move to make is to bring in Junk King Dallas Mid Cities to haul off all the unwanted stuff. This entry was posted in Dallas Mid City Junk Removal and tagged junk King, junk removal, move on October 22, 2017 by Junk King. Last updated October 22, 2017 .